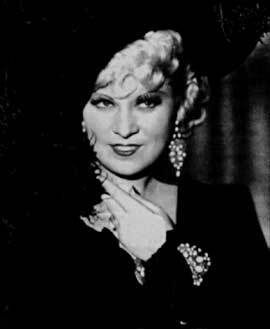 MAE WEST crossed paths with Clark Gable numerous times. She even testified on his behalf when a British woman appeared, saying Gable (working as a tutor under a different name) had fathered her daughter. • • In 1936, a trade publication announced: Clark Gable and Mae West are not included in the “Who’s Who,” the American publication issued early, which lists what it considers are the important people of the United States. Clark and Mae have millions of admirers but they still are unable to be mentioned in the pages of this noted book. • • It is good news to learn that Greta Garbo, Joan Crawford, Janet Gaynor, and Nelson Eddy all figure in the precious volume. • • When Mae West made her solo debut at Hammerstein's, the act was eleven minutes of dances and songs that were delivered in a Bert Williams like manner — — talking her way through. Mae selected "Parisienne," "Dancing-Prancing," and "Rap, Rap, Rap." Her closing number was a sultry cooch. • • Reviewing this variety artist in their issue dated Saturday, 25 May 1912, The New York Clipper felt that a number of well-placed comrades in the audience were there, helping her along. • • In their edition dated for Saturday, 25 May 1912, Variety's critic called her a "freak." In their opinion, Mae's presentation lacked "that touch of class that is becoming requisite nowadays for first-class houses." • • Apparently, Texas Guinan was having difficulties with the Shuberts over her show "Padlocks of 1927." When Variety printed an item on 25 May 1927 noting that "Mae West is being readied to jump in," their intention was probably meant to pinch some sense into the speakeasy hostess, who regularly paid for ads to promote her night spots in The New Yorker and whose spectacles attracted people from The Algonquin Round Table, an audience quite far from the circle of Mae West admirers. • • Sydney, Sunday — — Australians will not be permitted to view Mae West's latest picture, 'Klondyke Annie,' as the Federal film censorship has placed a ban on it, explained Brisbane's Courier-Mail in an article printed on Monday, 25 May 1936. • • Miss West, publicised as the "girl with the 50,000 dollars treasure chest," now holds a policy for that amount from Lloyds of London. • • A newspaper mentioned Mae West. • • May Mann wrote: Clara Bow, with flaming tresses when she was the famous "It" girl; Mae West, when she first came out from New York to seek a movie career; . . .
• • Thank you for reading, sending questions, and posting comments during these past eleven years. The other day we entertained 3,497 visitors. And we reached a milestone recently when we completed 3,400 blog posts. Wow! • • The Mae West Blog was started eleven years ago in July 2004. You are reading the 3449th blog post. Unlike many blogs, which draw upon reprinted content from a newspaper or a magazine and/ or summaries, links, or photos, the mainstay of this blog is its fresh material focused on the life and career of Mae West, herself an American original. Mae West: Lost 12 Lbs.